You’ve spent thousands on your leisure vehicle, so you’re going to want to store it somewhere safe and secure to protect it from thieves. 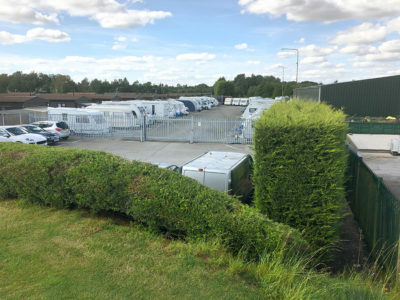 Secure motorhome and caravan storage, at home with locked gates, or at a CaSSOA gold rated site will generally mean you’ll get a cheaper caravan or motorhome insurance quote. In this month’s poll, we’d like to know where you store your caravan or motorhome. Where do you store your caravan or motorhome? A naval air station with 24 hr armed guard. We’ll report back the results in October along with a feature on what to look for in a good storage site for your pride and joy. And remember, if you ever change where you store your caravan or motorhome let your insurer know as this could effect your premium or invalidate a claim if stolen. For more information on storage, please visit our pages on caravan storage and motorhome storage. I agree with Jackie, so only have mine at home to wash it but it’s secured elsewhere. I too don’t want the tea leaves to know I’ve gone away to rip off my house even if I do have a burglar alarm. Sounds really secure Tony. Should keep the thieves at bay. Unfortunately as someone has pointed out if a professional thief wants your van they can bypass all and every security devices but what you can do is deter the opportunist thief. I’d like to flip this round and ask if anyone has the same concerns as me which is vans are so prominent when parked at our homes – so when they are not there it can be assumed we’ve gone away in them leaving our homes vulnerable. That plays heavily on my mind. We use a secure site, not cassoa approved, but as secure, this is due to a lack of suitable sites in our area (East Kent) meaning those that are approved are permanently full. We have the Al-ko security features as well as a Thatcham approved chain that goes through the offside wheel and through the chassis. These chains mainly for motorcycles can withstand at least twenty minutes of ‘attack’. Also CCTV and associated security lights. The caravan is on our drive and is in full view at all times. Van stored at home which is the only property at the top of a small cul-de-sac in a market town. The van is set back alongside a double-garage under a caravan port and can only be seen by visitors on the property. The van has both a Purpleline hitchlock and wheel clamp and is always left with the Emove in its activated position. In addition, a factory-fitted tracker is always activated together with the CriS enhanced chip. Gates to the drive can be closed and locked with a Gold Standard motorcycle lock. This set-up has never been breached despite being relatively minimalist. Can any deterrent save your pride and joy from ‘professional’ thieves ? ?